Finding a Wii console this holiday may not be quite as difficult for shoppers as it has been in the last few years. There's at least one retail giant packing the Wii heat. This week, Wal-Mart substantially boosted its Wii stock with thousands of units of the popular gaming console and reportedly made a killing through online sales Monday. Nintendo's console is indeed a top-seller at the major retail chain, among others. "We saw very strong response to the additional inventory we offered this morning and sold through tens of thousands of Nintendo Wiis by early Monday afternoon," said Wal-Mart spokesperson Ravi Jariwala in a statement. Whether the retailer will be able to keep them in stock is still to be seen. Despite increasing production, Nintendo previously warned it might be unable to keep up with customer demand for the Wii this holiday season. Wii availability has been spotty at best, but it hasn't stopped shoppers from snatching them up at a rapid pace. Nintendo president Satoru Iwata recently stated Wii sales over the Thanksgiving holiday week came in at 800,000 - more than double the number of units sold during the same period last year. 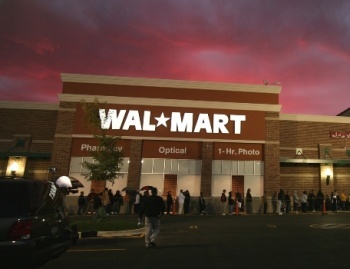 Wal-Mart said it plans to keep restocking its Wii supply through the holidays. Good luck with that.